PARADIGM strings are Ernie Ball’s most recent offering to the guitar world. PARADIGM builds on EB’s legacy of innovation, value, and putting the customers first. When the company announced these strings people scratched their heads and said “Huh? But doesn’t your business depend on people breaking strings?” Well, for us, it was a no-brainer: “Why be greedy? Let’s build a better mousetrap! That is the American way, after all.” And thus PARADIGM was born. For years, Ernie Ball spared no expense for the purpose of creating the best possible guitar string to resist against breakage and yet retain all the feel and sound of our flagship Slinky strings. Since they’ve hit the market, PARADIGM has received numerous tests, discussions, and reviews lauding PARADIGM’s durability, sound, and the fact that they were testing the world’s only string with a fully backed guarantee! Starting off we have the unstoppable force that is Paul Gilbert giving us a riveting demonstration of how the strings not only hold up to the rigors of high-level playing, but even then taking the test into the next level of absurd and still coming out like new. Paul prefers PARADIGM Super Slinky strings for their light feel, bend-ability, and absolute durability. It’s nice to know that I’m safe doing the most radical bending or whammy-ing that I can summon up, and still have my strings stay intact and in tune. Next up is the Mad Hatter himself, Slash. The Godfather of rock guitar since 1987 has taken to PARADIGM strings like a fish to water, and has still yet to lose any of his enthusiasm for them. Slash plays PARADIGM Power Slinky strings for their responsiveness, hefty tone, and reliability. Slash used PARADIGM strings all through the recording of his latest album Living The Dream with his band Myles Kennedy & The Conspirators and they will soon be on the road in support of that album. To this day, I haven’t broken a PARADIGM string yet. They hold up. 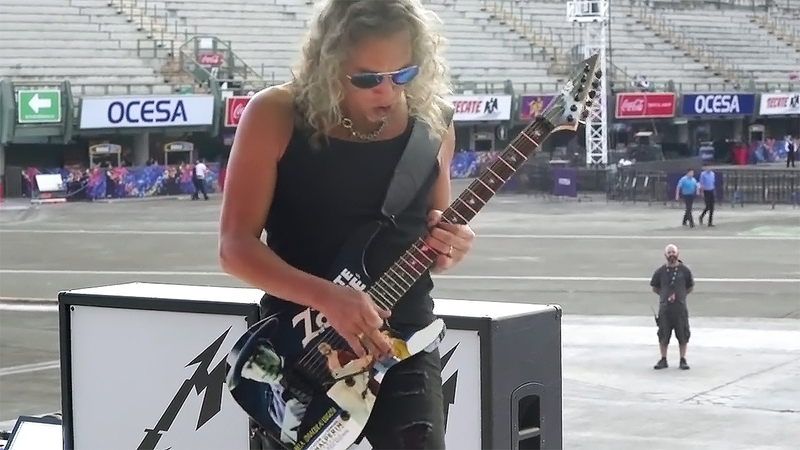 Next up is Metal’s own Master of Puppets: Kirk Hammett. As with all the players listed in this blog Kirk has spent countless hours putting his instruments through the most grueling conditions possible and just as many hours being practiced or played live. In this video you can see Kirk demonstrate that even while on tour and setting up, PARADIGM will come through for you. Kirk Hammett plays Ernie Ball PARADIGM Regular Slinky strings for their tuning stability, balanced feel, and ruggedness. Speaking of the new generation of guitar studs, Jason Richardson – the Shred King Next Door, has adopted PARADIGM without reservation and has been reaping the benefits ever since he got his first set of PARADIGM strings. Jason Richardson plays Ernie Ball PARADIGM Regular Slinky strings to keep his guitar playing as brutal and acrobatic as possible night after night. If you’re an acoustic player and have begun to feel left out, don’t worry. Ernie Ball has just the thing for you. As you can see, burly and brutal strummer The White Buffalo gets ankle deep with every swing of the pick and the strings keep asking for seconds. The White Buffalo plays PARADIGM Acoustic Phospher Bronze 13-56 strings for the absolute amount of punishment they can absorb without flinching. Finally we come to the Italian Stallion himself, JP. In this impressively aggressive video John’s determination to attempt to break his strings leaves him at a loss for words. If we can’t get one of the world’s greatest guitarists (who also happens to be a power lifter) to break our strings, and even ends up dismantling his guitar in the process, then what more is there to say? John Petrucci plays Ernie Ball PARADIGM Regular Slinky strings. As a long-time Slinky user, I’m really sensitive to any change in the way a new type of string feels beneath my fingers, the tension and tone etc., and the Paradigms hit the mark on all levels. Next we come to Joe Bonamassa, the modern day savior of blues rock guitar. Joe shows us extended bends and lightning licks with no end of flair. Across the Cave of Wonders that is Joe’s guitar museum known as Nerdville more and more guitars are being strung with PARADIGM since the difference is so clear. Joe uses a custom 11-52 set of PARADIGM strings chosen from individual string gauges for his personal preference. For years Hunter Hayes has been chopping away at the Country and Rock scenes, touring non-stop and bringing the guitar back to the forefront of both genres. The new breed of guitar stud demands the best, and Ernie Ball are the only ones giving players the best. Hunter uses Ernie Ball PARADIGM Power Slinky strings for their everlasting tone and absolute dependability in the toughest conditions. It’s not just about how long they hold onto the guitar. It’s about how long it stays sounding the same and reacts the same. They have to be just as punchy as the first time you play and these do that.